GeoPointer X is a GPR post-processing software with a unique feature: it, in one single system, combines the many aspects a survey. Those are the coordinates coming from the GPS receiver, the position on a map, pictures of the surroundings and many other useful information. 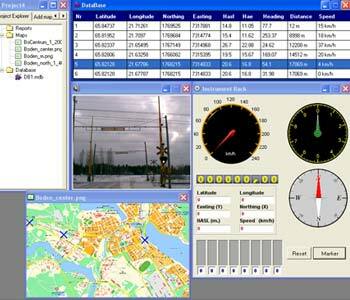 While using GeoPointer X it is possible to choose which of the data windows you need to display. One can have all data windows open or only a few of them, this will not be reflected in the amount of data collected or the quality of it. The only window that demands to be open, in order to store the data, is the photo data view. GeoPointer X brings new possibilities to the way geophysical data is analyzed, not only the data from the geophysical instrument is available but also a whole set of data about the survey location. Using GeoPointer X together with our triggering devices gives a real possibility of linking the ground penetrating radar data with a database describing the site where the data has been collected. In other words, combining the geophysical survey data and the data stored in GeoPointer X it is feasible to see both sides of the surface. The post analysis of the data will reveal the features available under the surface together with a picture of the surroundings above the surface. This linked data give us a better idea of the survey site and its position. The gathered information can be used while writing reports or detailed descriptions of a site. There are multiple choices in which to control the software. All the data is stored in one single database and that makes the post-processing of the acquired information a more simple and harmonic task.